I've been away from home too long, and I'm really looking forward to being back in Hawaii next week. My work here in the DC area has been keeping me very busy, but I was fortunate to get out for three days of flying at three different sites in the Blue Ridge Mountains of Virginia. It's been six years since I flew here last, and it was sweet to get re-acquainted with the air here. I was glad to see some familiar faces, and I also made quite a few new flying friends. I wrote about the first flight a few weeks ago here: sweet ridge lift mixed with gentle thermals and buoyant air over the meandering Shenandoah River, at a site two hours west of DC. I flew with Hugh (the president of the DC club), local comp pilot Tom, and newer local pilots Charlie and Laszlo. 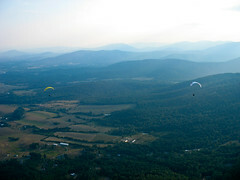 The second flight was an epic adventure that almost defies description. But I'll try anyway. I met local comp pilots Juanito and Tom for a two and a half hour drive out west to Skyline Drive and Virginia's highest launch site (3400 feet ASL). We were joined by green but enthusiastic local pilot Laszlo. Once we got there, Juanito and Tom were eager to get going and shoot for some big distance. Me and Laszlo were not quite so ambitious. And I was a bit nervous about some of the logistics. I knew this was a sensitive site with some permission problems, and furthermore, I knew there was no legitimate LZ, and we hadn't made any plans for how to get back up to the cars. The comp pilots planned to fly far and hitchhike back if possible. They were soon up and away, and headed over the back and out of sight. I helped Laszlo launch, and then I followed. The two of us bumbled around in weak and disorganized thermals for an hour before landing in a field below, and making the really had decision to try and follow the powerline trail back up to the top. Laszlo said he had heard that the hang glider pilots used to hike back up in the old days. He figured it wouldn't take us more than an hour. I wanted to take our bags, but he convinced me that we should drive back for them after we got the cars. We left our gear at a nice lady's house, and she warned us about rattlesnakes, copperheads and bears. She also said she and her husband had tried for years to find a way up to the top and had never managed it. The powerline trail turned out to be a dense thicket of sharp thorny brambles, so we veered into the forest to make our own trail through the trees and bushes. The forest was steep and also quite dense, and we made very slow progress, sometimes crawling on hands and knees through gnarled groves of mountain laurel, other times scrambling up granite boulder slides. At one point we disturbed a wasp nest, and after several incredibly painful stings each, we fled back down the slope to navigate a wide path around that spot. Several times we thought we must be near the top, but each time our hopes were soon dashed by a glimpse of the faraway ridgetop. After three long and tormented hours, we emerged onto the Appalachian Trail at the summit. Laszlo called Tom and found out that he had sunk out over the back, and then managed to catch a ride all the way back to his house, a two hour drive with some helpful stranger. Then we got a call from Juanito who told us he had landed after flying four and a half hours. It turns out he had flown the entire length of the Park, and kept going towards Richmond, making it almost 70 miles, and setting the Virginia state XC record. Laszlo went to get our bags while I went to find Juanito. What an unforgettably long and crazy day that was. 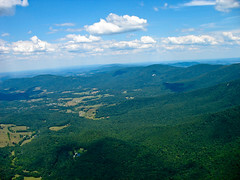 The third flying day was a very fine thermal day with Motorhead Paul - he was passing through town and invited me to join him at a flying site two hours southwest of DC in the Blue Ridge foothills. We were joined by local pilots Jim and Laszlo, and Jim's friend Fabian from Colorado. We all flew twice, and each time we found plenty of thermals to take us high over the ridge there, and a ways out over the valley as well. By the end of the day the lift had mellowed to a smooth and uniform texture, and as the sun set we finally landed and headed out to grab some dinner at the local pizza place. Thanks to all the local DC area pilots for their hospitality and help. I will definitely be back with my wing for more flying adventures on future trips. Jaunito rocks. Just sorry he didn't make it out to Oregon this year. Make way, the king is coming, the king is coming.